Chief Sephardic Rabbi Shlomo Amar says the torching of a mosque in the northern Arab village of Tuba Zangaria may have not been committed by Jews, and that the attempt to ascribe the act to "price tag" activists is basically a "blood libel". Speaking in an interview to Radio Kol Hai, Amar said the speculations were premature, but that "we have no way of knowing if this wasn't a malicious act aimed at inflaming the conflict and increasing the hatred between Jews and Arabs." The rabbi, who visited the burned mosque on Monday afternoon, explained: "We are experienced people. As you know, blood libels about Jews killing a Christian child have been common in all generations. Damage was caused to entire communities, killing and loss, God forbid, because of those false libels. "We don't know who did it…It could be an insensible person and it could be a non-Jew. We don't know anything yet. What it says out there, in any case, means nothing. Sometimes people do things and blame them on others." Amar stressed, however, that "whoever did this, did a very bad thing… This has only caused damage. There is nothing good about it, nothing real – just heavy damage, and it could lead to worse things, God forbid. We condemn this act." Rabbi Amar said in the interview that if the arsonist was in fact Jewish – he was subject to some of the Dinei Rodef ("laws of the pursuer" - one of the few provisions in Jewish law permitting extrajudicial killings). He explained that the person should be stopped from carrying out his evil scheme – "even in harsh ways" – but should not be killed. Asked by the interviewer, Noam Zigman, how he made the decision to visit the mosque, Rabbi Amar explained that he saw it as his duty to set a personal example for the respect one must show to places holy to different religions. Chief Ashkenazi Rabbi Yona Metzger, who also took part in the visit to Tuba Zangaria, joined the condemnation but criticized non-Jewish clerics demanding that he condemn such acts while they remain silent after Arab terrorists attack Jews. Metzger said he was still waiting for condemnations of the terror offensive on southern Israel in August and the murder of Asher and Yehonatan Palmer last week near Kiryat Arba. 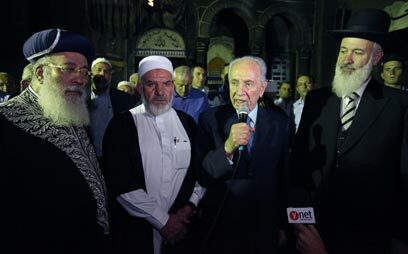 Nonetheless, Metzger conveyed a message of reconciliation to the village residents, saying that if the mosque was indeed torched by right-wing activists, the Jews and Arabs were "in the same boat", after the IDF had also become a victim of the "price tag" acts in the West Bank. "We are here to calm everyone down and prevent incitement," the chief rabbi added. "We have been through Krystalnacht and we know what it means to see holy places go up in flames. Such a thing cannot be ignored and we are here to protest." See all talkbacks "Rabbi Amar: Mosque arson may be blood libel "